How you can maintain your wellness during pregnancy using 100% natural ingredients. You know what’s important to think about when you’re expecting? You. Taking care of your own wellness by making sure you are rested, nourished and supported will only make things easier, for you and your little one. And, by maintaining a focus on your own wellness for the nine months you’re expecting, it will be that much easier to keep it up later on. It probably feels like your world is changing on every level — physically, mentally, and emotionally. This can spark a lot of questions, including what kind of self-care routines are going to be safe and effective for not just you, but your baby, too. When it comes to keeping your wellness up, we’ve got you. Here’s how to maintain your personal well being so you can feel your best when the newest member of your family arrives. Your skin can change a lot at this time, what with the rush of hormones and the growing baby bump. The good news is that many of these changes are completely normal and will fade with time and natural care. Just like your baby can feel your emotions, they also absorb anything you put on your skin. As a soon-to-be mom, using products that are not only effective, but safe for your and your baby is a top priority. We make it simple to know what’s safe to use. Our Baby Care products are as pure as can be with no toxins, no harmful synthetics and no artificial fragrances — just the gentleness of nature. 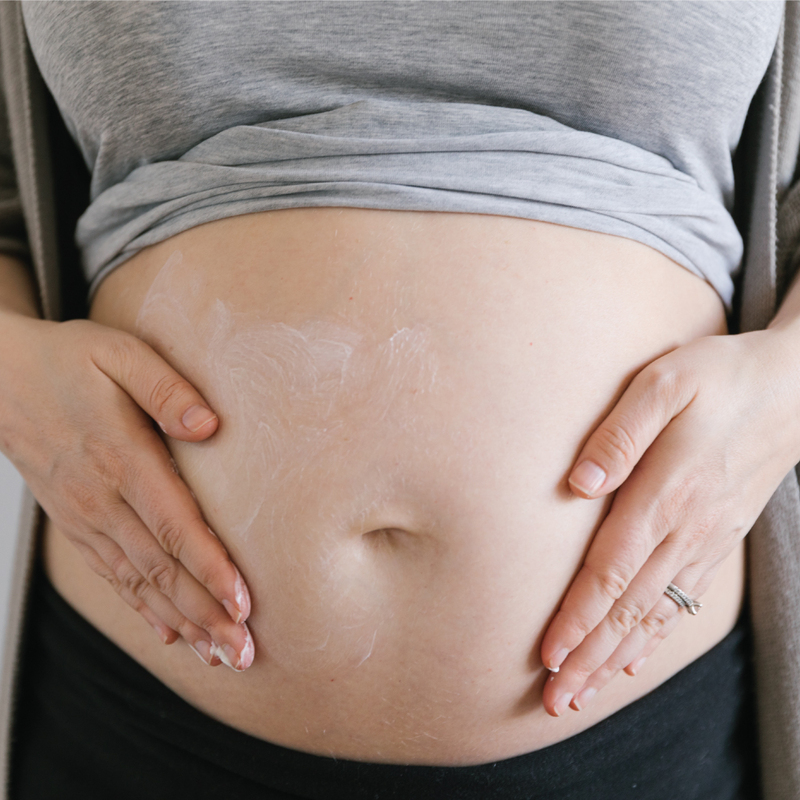 These 100% natural skin care options will keep your skin soft and soothed so you feel comfortable in your body before, during and after pregnancy. Our new Vitamin Ease Stretch Mark Minimizing Cream gives your body room to grow. It reduces the look of stretch marks with deeply moisturizing aloe, coconut oil and vitamin E. Formulated to smooth, condition and soften your skin during and post-pregnancy, this vegan cream keeps you glowing long after welcoming your little one to the world. In addition to stretch marks and acne, you may also get dark spots on your face and neck, or a dark line on your belly known as linea nigra. This is all a totally natural part of being pregnant and are indications of the amazing process that is happening inside your body. We’ve all done it: neglect our own needs when there’s a big life shift on the horizon and worry about what the future holds. While your body is changing, your hormones are flowing and your responsibility is growing, it’s easy to get swept up in the stress and overlook the excitement and wonder. When we get stressed, our body responds by releasing a hormone called cortisol, which can be transferred to the body through the placenta. Basically, this means when you feel stressed, your baby feels stressed. Fortunately, the opposite is also true, and when you feel calm and relaxed, your baby will also rest easy. Maintaining practices that help you keep a balanced and calm perspective on life will mean a happy, healthy mom and baby. If regular meditation isn’t part of your current self-care routine, pregnancy is a good time to try it out. Training your mind to let go of stressful feelings and stay present in the moment at hand will serve you well after your little one arrives. Try taking ten minutes out of each day to sit quietly and get comfortable with your thoughts and emotions. We love the Headspace app for having access to guided meditations on our device, in any moment. To soothe your mind and your body before meditating or any time you want a little support, roll Mother’s Wellness Soothing Blend onto your pulse points. Specifically formulated to be safe for expecting mothers, this blend of grapefruit, lavender and roman chamomile will help calm any worries about what’s to come so that you can focus on being well and staying well. Sometimes, what we need is just a little help from our friends. If you find yourself thinking about the same questions over and over, reach out to your friends and family for a chance to chat it out and build your support network. If your circle doesn’t include many mothers, try joining a group so that you have the opportunity to connect with people who are going down the same life path as you are. This can make all the difference to how you feel about the process of starting a family. Surround yourself with supportive people who remind you that you’re safe and loved—because you are. The wisdom of your body is amazing (it can create life, after all), and one thing we can all do to feel better in our day-to-day lives is to listen to the signals it sends us. As your body changes over the next nine months, you’ll probably get some symptoms and signs you haven’t experienced before, especially since you’re living for two, sharing your body with a tiny human who has different needs than you. Morning sickness is common during the first stage of pregnancy. While it might not be pleasant, it’s your body’s way of telling you to take it easy. If morning sickness is part of your journey, use it as a reminder to stay hydrated and fed. Keep a water bottle on hand all the time, including beside your bed so that you can recover lost fluids. Fibre-rich and mild snacks, like crackers will help your stomach weather the storm—a cracker or two when you wake up may make a world of difference to your day. A growing baby bump requires plenty of rest and relaxation, but exercise will also do your body good. Generally speaking, if you were moving your body in certain way before getting pregnancy, you can continue the same activities during pregnancy—as long as you have your health care practitioner’s go-ahead and it feels right in your body. Low-impact activities like yoga, swimming, walking, or stationary biking are amazing options to keep your body moving and the endorphins flowing through all your trimesters. You’re about to embark on a lifelong journey of considering another person’s needs, in addition to your own. Enjoy this special time before your little one arrives to prioritize your self-care. The best thing you can do right now—for you and your baby—is to stay nourished, hydrated and surrounded by people you love.